Uses OE Ford ST Calipers. 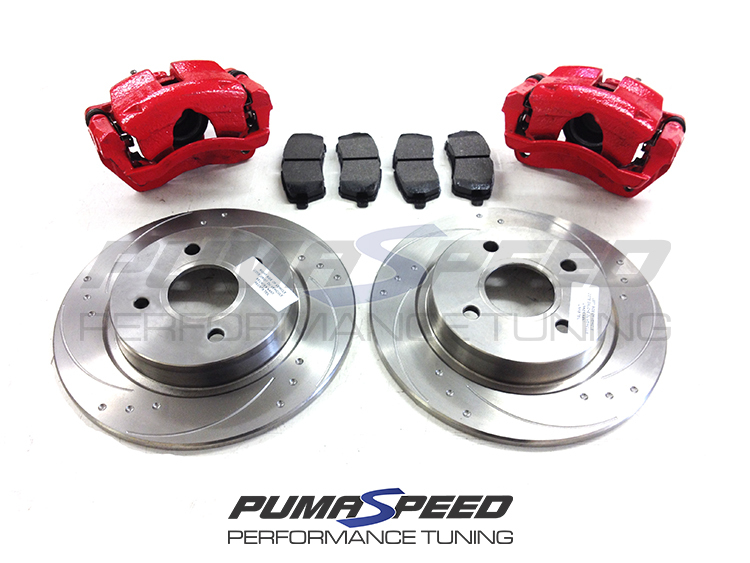 The new OEM syle Pumaspeed Stage 2 Brake Upgrade for the Fiesta Mk7 is now available. With the capability of the 1.0 Ecoboost being able to run ST power, upgrading your braking strength to match is essential to keep the new found power in check. To keep this conversion simple to install and most importantly inexpensive, we have used the original Genuine Ford caliper. Rest assured this will be the most important investment in safety you do for the Fiesta Mk7 and should not be over looked. Upgraded Zero Sixty discs and Mintex M1144 pads are available in the drop down menu. The Pumaspeed Workshop team are ready to fit the Fiesta Mk7 Stage 2 Front Brake Upgrade Kit (280mm) in our Head Office located here. Therefore making parts and labour a total cost £462.95 (inc. VAT). Pumaspeed have a specialist distribution team that can dispatch the Fiesta Mk7 Stage 2 Front Brake Upgrade Kit (280mm) to any destination worldwide.